The Poet, The Warrior, The Prophet by Rubem Alves | Ross Gale is a writer and editor from the Pacific Northwest. 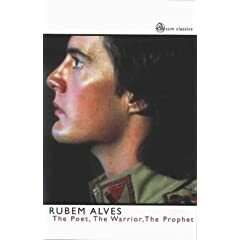 The Poet, The Warrior, The Prophet by Rubem Alves is the most important book on the subject of Theopoetics. Unlike Amos Wilder’s Theopoetics: Theology and the Religious Imagination–which, although claims to be writing against the discursive, prosaic, and rationalistic, is written in a form that is discursive, prosaic, rationalistic–Alves’ language and metaphors are pure poetry. While Wilder marches, Alves dances. This book is easy to read and difficult to understand. Not unattainable, but challenging. You will be challenged to a degree you’ve never been challenged before. This book might scare you. But it will also transform you. I recommend the book for anyone, but especially for writers and poets. The following is a summary of each chapter. The first chapter is wrought with metaphors and analogies. His first metaphor is that of a spider in his office who weaves its web with internal knowledge of its purpose and, using the foundations of walls, can make connections from one side to the other. Alves relates this to teaching, to lecturing, where one sets down a framework and begins to weave the lesson together, begins to make it clear, smoothing out the rough spots, clearing any questions. He likens teachings to a mirror. Where a good teacher relates exactly what’s in the mirror. And that’s when the problems began. Alves started seeing things inside the mirror that were not in reality. How could he share these? How could he teach them? He was a philosophy teacher who learned that he was a poet. A poet who couldn’t teach the world as he saw it reflected in the mirror, but a poet who spoke the words (explored the worlds) inside the mirror that only raised question, caused confusion, grew mountains and cliffs in our journey to answers and clarity. He had to unlearn all that he had learned. Alves begins with a Gabriel Garcia Marquez story where a dead body floats to the shore of a village whose people are spiritually dead. Through the silence of the dead body, as the women prepare for the burial, they villagers begin to imagine who the man was, what his life was like, how he walked and talked. They began creating thoughts they had forgotten, joy they hadn’t experienced, words they hadn’t spoken. Through death the people of the village were resurrected. Life came through silence. A “pregnant silence” surrounded by mystery and mist. Where everything is unclear and vague. Clarity is death because it ends thoughts, it ends imagination. It causes the searching to stop. Words and flesh are the same thing. We are made of words, like old leather parchments, palimpsests, that were used for writing. Then the writing would be erased and new writing would begin. But the old writing never leaves, it’s always there. And with technology we can see that old writing. In our own selves we are written on by the Word of God. “Truth is a Poem which became flesh, the body of Christ.” And the depth of these words are beyond our reason. Alves continues the story of the village that was resurrected by the dead man and creates a story of his own comparing the Enlightenment philosophers and their search for scientific truth about the dead man and how it really happened to the village that is now alive, where adults play with children, where babies are being born and new houses are being built and gardens are being grown. If poetry is a dance then prose is a march and the Enlightened philosophers are slowly marching while the villagers are dancing and skipping and one rumor said someone even flew. The Philosophers search the past to confirm the truth while the villagers live in the present to confirm the past. The past is living in them. But when the Enlightened Philosophers come to the village to share what they found about the dead man the villagers go home that night marching. They do not dream. They no longer share stories about the dead man. Alves’ story is timeless. It’s a scathing attack on the cold, enlightened, scientific thinking that arrests imagination and destroys mystery and poetry. What Theology imprisons, Poetry, Theopoetics sets free. The solid, clear answers, that theology provides are like birds in cages. Poetry is vast and infinite. Alves transitions from the magical power of food to transform those who partake in it, to the magical power of poetry that transforms and impregnates in the silence.